Today is my older son Emery's eleventh birthday. Cue swirling cliches: how big, how fast, how grown up, and so on. Yes, there's all of that. And then there's the menu. As you may remember, Emery is the child whose first original recipe involved bitter lettuce and truffle oil. Whose proudest accomplishment to date may very well be the soup with Asian greens he made all on his own. Whose birthday party last year involved a small-plates dinner party for ten 10-year-olds. This year his birthday dinner involved his two closest friends, one of whom eats gluten-free, and he designed a menu that met her requirements (Italian ragu over polenta cakes, roasted cauliflower, sauteed spinach with garlic, vanilla ice cream). It seems only fitting that he would have a special breakfast request on his birthday. 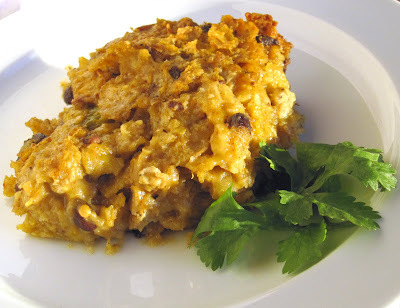 Thus, the "chilaquiles" casserole pictured above. I was trying to remember, this morning, when and why I started making this casserole. I can't figure it out. If I had to guess, it was probably born of both inspiration (everyone loves Mexican!) and desperation (how am I going to use up this leftover [fill in the blank]?). But however it came into being, it's a classic in my house. Mexican flavors, a handy vehicle for many of the small bits left in the refrigerator after the weekend, do-ahead ease - perfect for both school days and brunch parties alike. All measurements below are approximate and flexible, as are most of the ingredients. Think of this as the canvas with background. The specific colors - those you get to choose. I got crap for posting this before from the "You must never leave food at room temperature!" police, but I will mention again that I mix this up in the evening, put it in the cold oven overnight, and use my timer to bake it in the morning before everyone gets up so it's ready at breakfast time. I have never had a problem doing this. I realize it violates restaurant health code policies. Make your own decision. Mix together all ingredients until well blended. Pack into a baking dish and pop into the oven for about an hour. Serve with sour cream, salsa, guacamole, or hot sauce. Or all of the above. Well, fortunately, what we do in our own kitchens is not subject to code! I doubt any of us, however fastidious, would ever pass inspection. This looks so incredible! So glad I found your blog. Congrats and looking forward to meeting you in NYC in Feb! We usually eat chilaquiles for dinner, but I love em! Happy birthday to Emery, who is, indeed, precocious. this looks amazing. thanks for posting the recipe. have a great time in ny and congratulations! Chrystal, thanks for letting me know that your family enjoyed this recipe. What a wonderful message to come home to after a long week!